Albert Stanley White, known as Stanley, was born in Yeovil in 1900. He was the only son of railway platelayer Albert Samuel White (1869-1938) and Henrietta née Beare (1872-1929). Albert and Henrietta had eight children, only six of whom survived childhood; Ethel (b1896), Amy (b1898), Stanley, Florrie (b1902), Kathleen (b1906) and Rose (b1908) - although the Western Gazette would later refer to their 'eldest son', I could find no trace of him. In the 1911 census the family were listed at 75 Park Street and before enlisting Stanley worked at the Woodland Grove Dairy. Stanley enlisted at Taunton. The date is unknown but it is likely to have been in early 1918 when he turned 18. Stanley joined 1st Battalion, Royal Warwickshire Regiment. His Service Number was 41286. It is not known when Stanley joined his battalion at the Front. The 1st Battalion, Royal Warwickshire Regiment, had been engaged the Battle of Hazebrouck and in the Battle of Bethune in April 1918. It is likely that Stanley joined them after these conflicts, but before their next major engagement, the Battle of the Scarpe (26 to 30 August 1918). Stanley was reported as being seriously wounded at the beginning of July, but died from his wounds on 5 August 1918. He was just 18 years old. The Western Gazette, in its edition of 12 July 1918, reported "Mr and Mrs White, of 75 Park Street, have heard the sad news that their son, Private AS White, of the Royal Warwicks has been seriously wounded. Before enlisting he worked for Mr F Bird, of Woodland Grove Dairy. Mr and Mrs White’s eldest son is still in hospital in France suffering from gas and trench fever." In its edition of 16 August 1918, the Western Gazette reported "Mr and Mrs White of 75 Park Street, have received the sad intelligence that their son, Private AS White, of the Royal Warwickshire Regiment, has succumbed to wounds in a General Hospital in France." 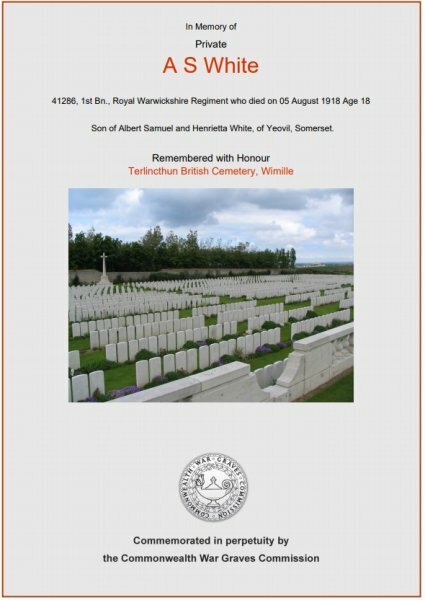 Stanley was interred in Terlincthun British Cemetery, Wimille, Pas de Calais, France, Grave II.A.29., and his name is recorded on the War Memorial in the Borough. The Commonwealth War Graves Commission certificate in memory of Stanley White.